These fiesta-worthy flavors are sure to liven up any party! Whether outdoor grilling with your family or entertaining friends, Fiesta Grilled Mexican Street Corn is the perfect 30-minute appetizer or budget-friendly side. Need a 30-minute appetizer or budget-friendly side? 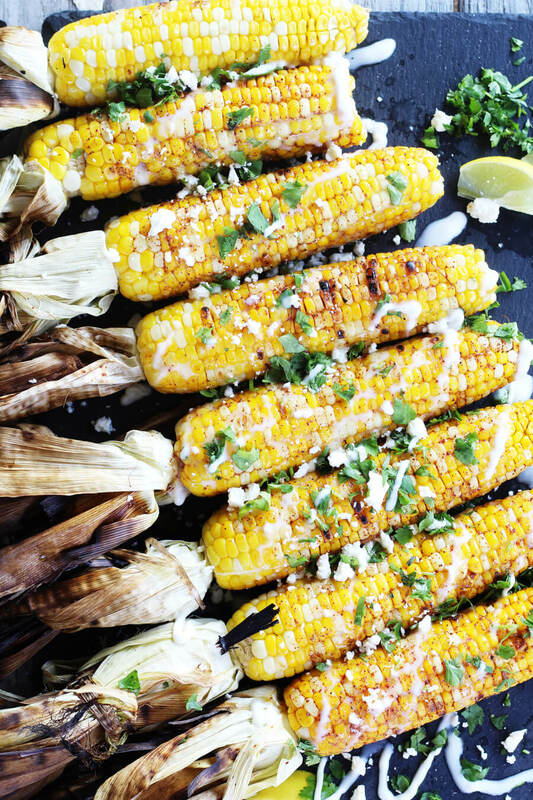 If you’re grilling at your own fiesta, serving the best ever Elote is a no-brainer. The South of the Border-inspired flavors of this Fiesta Grilled Mexican Street Corn will liven up any party, especially when you use Land O’Lakes® Soft Squeeze Spread. This fun, 30-minute appetizer only requires 10-ingredients and fits perfectly on your grill next to burgers, chicken, and hot dogs, making clean up a breeze. Next time you are entertaining friends, turn to this simple recipe to round out the meal. A 30-minute appetizer or budget-friendly side that is sure to be loved by all! Soak the corn in a sink of cold water for an hour before grilling. Drain. Heat grill to medium high, around 400ºF. Place the corn in the husk directly onto the grill. Cook for about 20 minutes, turning every few minutes to brown all sides. While the corn is cooking, in a small bowl, stir together 1/2 cup of the squeeze spread, chili powder, cumin, garlic powder, salt, and cayenne until well combined. Set aside. When the corn is done, remove it from the grill. Let it cool slightly. Peel back the husks and pull away the silks. Reduce grill heat or turn it off. Spread the spiced butter spread mixture onto all sides of the corn. Place the corn directly on the grill for 3 - 5 minutes, turning to heat it through and melt the spread. Arrange the corn on a platter. Squeeze fresh lime juice over the top. Sprinkle with the cotija cheese crumbles and the cilantro. Finish with additional squeeze spread and serve immediately. Home Chef Tip: Not a fan of cotija cheese? Use feta instead! Love this delicious recipe? Try these too! Showcase this Mexican Street Corn Pasta Salad recipe as the star side dish at all of your summer gatherings this year. Bursting with flavor and textures, everyone will love this unique side! These personal-sized Spicy Chicken Street Corn Pita Pizzas are perfect if you’re cooking for two. Inspired by the flavors of Mexican Street Corn, this semi-homemade, 30-minute meal is perfect for date night! We hope you enjoy this Fiesta Grilled Mexican Street Corn from Buy This Cook That, as much as we do. If you love this recipe and you’re looking for more like it, visit our Outdoor Grilling Section. For daily recipe inspiration, subscribe to our newsletter, like us on Facebook, and follow us on Pinterest and Instagram. Enjoy!